Chrome OS presents an intriguing solution to the 2-in-1 software conundrum. Google is cooking up a new formula for detachables, and it has an intriguing recipe with the new Pixel Slate. Though Microsoft has a solid desktop environment in Windows that makes its Surfaces excellent productivity tablets, it doesn't have the same library of touch-friendly apps that Android and iOS offer. The iPad Pro, on the other hand, is swimming in apps but just doesn't have the multitasking chops of a full desktop OS. Chrome OS seems like a potential opportunity to marry the best of Android, with its plethora of apps, with an established, functional desktop interface. With the Pixel Slate, senior product manager Ben Janofsky believes the company has "truly delivered the first uncompromised device" in this space. According to product manager director Kan Liu, 2-in-1s are "the only growing segment in the PC market," and the Pixel Slate is designed for people who want one device for both work and play. First, the hardware. The Pixel Slate is a 12.3-inch tablet with a 3,000 x 2,000 screen that makes it one of the most pixel-dense in its class (more on that later). It's also impressively thin, at just 7mm (1/4 inch), and weighs a relatively light 1.6 pounds. You might not be able to tell at first glance, but it comes in a midnight blue hue that, frankly, just looks black. Though I like the Slate's anodized aluminum build, its overall design is a bit generic. Google redesigned Chrome OS for the Slate, and it has two different profiles. Desktop mode kicks in automatically when the tablet detects a mouse or trackpad (but not a keyboard), and it's an interface that you're probably already used to. Unfortunately, there's no way to manually activate this mode -- it kicks in only when the system detects a mouse, because Google believes you'll need a precise cursor to properly use a traditional desktop. Disconnect the Slate from its mouse or trackpad and it switches to a touch-friendly interface that has some familiar Android-like touches. For instance, you'll find icons for your installed apps strewn across the home page and a row at the top with what the OS thinks you want, à la Android 9 Pie. Liu said he felt it was important to create a consistent experience across the ecosystem. "A lot of the UI you see here will look very familiar to someone who has a Pixel phone," he said. Other Androidy examples include a Do Not Disturb mode that disables your notifications, and the Night Light toggle. The Quick Settings panel now has a touch-friendlier grid layout and a blue-on-dark-gray color scheme. Oh, and since this is Chrome OS, you can also run plenty of Android apps. Future smartphone features may eventually make their way to Chrome OS as well. "As we evolve on Android, we consistently evolve together," Liu said. To reinforce the consistency, you can also use the same USB-C charger for the Slate and the Pixel phones. There are still some small differences, though, like swiping vertically on the home screen to see more apps, instead of horizontally. The location of the quick settings is also different -- they live in a tray icon at the bottom right, instead of in a pull-down shade. 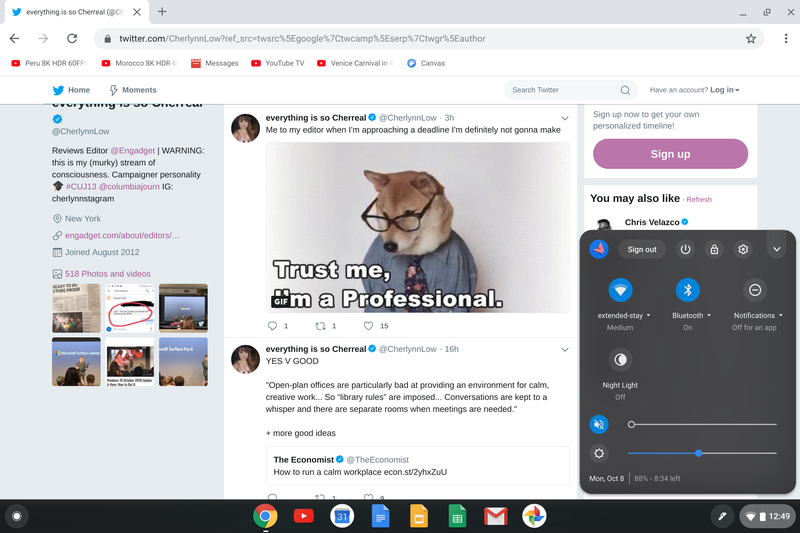 While you can't use all the floating, overlapping windows you want in this touch-friendly version of Chrome OS, you can still do some light multitasking. There's plenty of room here to run two apps side by side (in split screen), and you can resize them to take up whatever proportion of the display you prefer. Google also added a gesture that lets you drag and drop a browser tab that enables it to quickly show up in split-screen mode. I don't foresee myself using this much, but it's nice to know it's there for when I need to do some comparison shopping. Though you can already use Android Messages in a web browser from any desktop, the Pixel Slate will better integrate your texts into Chrome OS. I didn't get to see this for myself, but, according to Liu and Janofsky, you won't have to scan a QR code to load up Messages the way you currently have to on the web. Instead, it will show up in a separate app window that you can have running in the background even if you close the browser tab, and notifications will be built into the OS. Of course, no 2018 Google product is complete without Assistant. Liu's team rebuilt the digital helper for Chrome OS, and he said it is now "four times faster than what we originally launched on this platform." The Slate has a pixel density of 293 ppi -- something Google touts as the highest in its category. Certainly it beats the 12-inch iPad Pro, the Surface Pro 6 and the Samsung Galaxy Tab S4 on that front, as they all come in at between 260 and 283 ppi. Google is calling this a "Molecular Display," because it's invested a lot into making this high-res screen -- you can see the details to the molecular level, get it? Google was able to squeeze a higher-resolution display into such a thin device because it uses a power-efficient LCD tech called low-temperature polysilicon (LTPS). This panel uses less energy per pixel, allowing for sharper displays without sacrificing battery life or size. The company is promising up to 12 hours on a charge, which is impressive for the Slate's waifish profile and 1.6-pound weight. More important, it doesn't hurt image quality. Videos and pictures looked sharp, bright and vibrant. The 8K HDR YouTube clips I saw were gorgeous, and I could see every little detail and shade in the old buildings and leafy landscapes. I can't vouch for the power efficiency claims yet, but "Molecular Display" is a funny name that rivals "Liquid Retina." You can also draw on this screen with the Pixelbook Pen, which now comes in a blue color option to match the Slate. It was fluid and sufficiently sensitive during my testing, letting me scribble artfully across a canvas from the lock screen. Sadly, Google is just another company that doesn't see fit to include the stylus with the tablet, so be prepared to shell out another $99. Flanking the display are two front-facing speakers that were, let's say, functional. Google says it's still working on the audio, so it's possible the sound quality might get better before launch. One of the most important components to get right for a productivity device is the keyboard, and so far, I think Google delivers. The Slate doesn't actually ship with its companion folio, but you might want to spend the extra $200 to get it. It's a magnetic keyboard cover that doubles as a kickstand that you can adjust to prop the tablet up at any angle you'd like (similar to the Pixel C and a ton of other detachables). It locks at the top and bottom for extra rigidity, but during my hands-on it was pretty sturdy even at angles in between. It was slightly annoying when the magnets kept latching on to other metallic surfaces, though. The keys themselves are round, and apparently early users found that the lack of corners actually made for more accurate typing. "They were making fewer errors because they were less likely to hit corners of [the wrong] keys," Janofsky said. While I didn't type enough to get a sense of accuracy, I didn't find them to be that much different from the rectangular island-style buttons I'm used to. While there isn't a lot of travel (just 1.2mm) in this keyboard, it was comfortable enough to type on, much like Microsoft's Type Cover. Like Apple and Microsoft, Google took special care to make these keys quiet -- going so far as to call them "Hush keys." I never found previous keyboard cases all that noisy, but the Pixel Slate's buttons seemed more muted than others I've tried. The space bar, though, still resonated noticeably when struck. I'm glad that Google adopted a pogo pin connection for the Slate and its keyboard, as opposed to Bluetooth, like it did with the Pixel C, which caused infuriating connectivity problems. I was also impressed that the device switched from tablet to desktop mode basically the instant the case snapped on. It also helped that the Slate's screen is larger than the Pixel C's by two inches (diagonally), allowing Google to add a surprisingly decent trackpad and an escape key to the folio. There's also a dedicated Assistant button on the left of the space bar, making it easy to type out commands without making a sound. The Slate comes with a pair of 8-megapixel cameras -- one on the rear, if you simply must take photos with your tablet. The one in front is optimized for videoconferencing, and Google is calling it the Duo camera. It has a generous 190-degree field of view and 1.4-micron pixels for better use with groups and in low light. This is also the first Chrome OS device to support fingerprint unlock, with the sensor built into the power button. Finally, like any respectable productivity machine, the Slate comes with multiple USB-C ports. It's only got two, which isn't exactly generous, but at least it beats the iPad Pro's single lightning port and Smart Connector (pogo pins). The Pixel Slate will start at $599 when it's available later this year (Google hasn't shared an exact date yet). To really use it as a detachable, you'll probably have to buy the $200 keyboard folio, making this a total investment of at least $800. That's quite a lot to cough up, but still hundreds less than the 12-inch iPad Pro and the just-announced Surface Pro 6, which start with more powerful processors. And it's slightly cheaper than Samsung's Galaxy Tab S4. I'm surprised at how much Google was able to cram into the Pixel Slate while keeping its costs much lower than the competition. "The thing I really want users and readers to take away is that Google is investing in tablets," Liu said. "For a long time, we haven't, but we're changing that." Of course, Google isn't alone in making Chrome OS tablets or detachables, with partners like HP and Acer already having made the first such products. Dell and Lenovo will no doubt push out their own offerings eventually, too. What I'm most excited about is the potential for Chrome OS to be a powerful 2-in-1 OS. It looks like Google was able to take the lessons it learned from the mistakes of the Pixel C (a strangely beloved device in spite of its flaws) and parlay that into a promising contender for the growing 2-in-1 category.